Supplementary material reads: "Trans World Airlines Public Relations Dept., Los Angeles. MIchigan 9441. For immediate release. Los Angeles International Airport, Nov. 22: Colorfully clad in an Indian Sari, Miss Indra Devi. 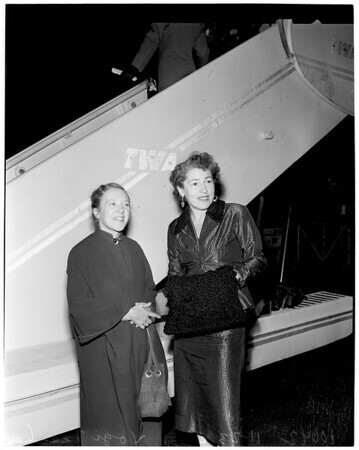 well-known teacher of the science of Yoga arrived here today aboard a TWA Constellation from New York. She had been on a lecture tour of the East. Although of European birth, Miss Devi has studied Yoga in India for 12 years. She is the only Occidental woman to ever teach Yoga in India, the country of its origin. She is the author of the recently published 'Forever Young--Forever Healthy."